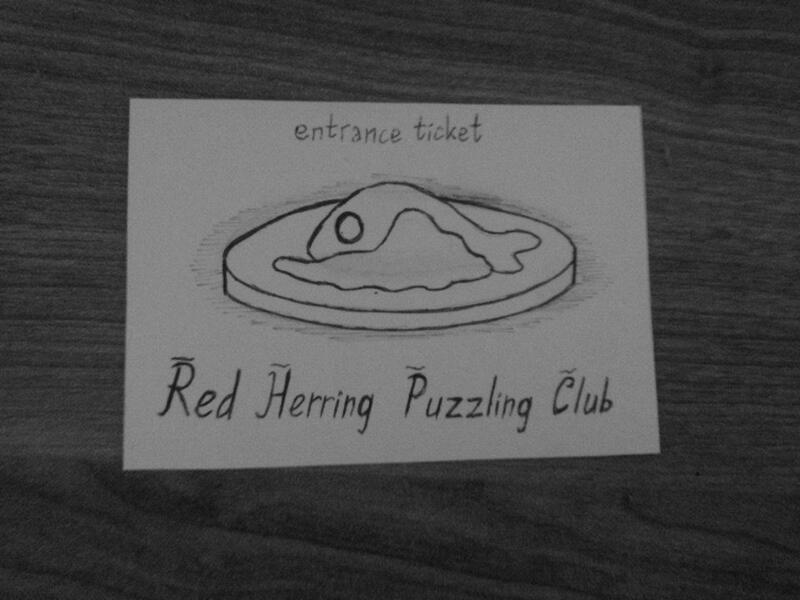 I got a ticket to the Red Herring Puzzle Club in the middle of the street. There was just a guy giving them out, like some advertisement flyers. When I took one, I asked him "This club advertises so hard, are they low on members?" "That's not the problem here, mister. They just don't accept everyone. First, you need to get to the place, then you get the stamp so they can assess you. Most just give up on the way. There are also rumours that a 7 and a 9 changed places somewhere in their last puzzle, which made it unsolvable". "So, they are looking for someone who can solve it, despite the mistake". "They are, but you have to hurry if you want to try. The fortnightly hiring ends on the first of July". That got me interested. I studied the invitation thoroughly. 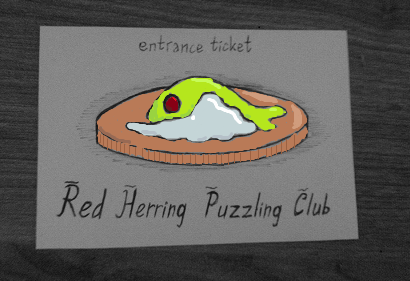 After some googling, I found an old-timey tavern "Red Herring", with an emblem that looked exactly like this image (except coloured in tones of red), and got there. It was quite empty. "Does the puzzle club reside here?" - I asked the bartender straight away. "Only if you have your ID and the ticket". After the bartender put a stamp on the ticket, he gave me... a pack of pencils. "One last problem here, Mr Blue. Your ticket appears to be... uncoloured. How about you order a drink, have a seat there and colour it properly?" Being caught a bit off guard, I sat at the table. But as soon as I took out a red pencil out of the pack, I saw a bundle of tickets under the table. All different-coloured, some torn or crumbled. The colouring was the test. And I believe I had only one try, because my name had been documented. Some kind of code, not sure if it's solvable by itself, though. Looking around the bar, I found a bunch of same-looking sheets with a crossword - to keep the visitors entertained, I guess. Now, this is that crossword. 2) Attach a properly coloured herring to your answer. "I see you changed a 9 and a 7 in your puzzle, didn't you?" Without blinking an eye, he answered: "Maybe it is the God who mixed them up, and I just put them right". I smiled and nodded him to go away. That was pretty fruitless. - Are you solving this one too? Any success as of yet? A bearded man of unknown origin joined me at the table. - Tell me about it! I mean, these can't be real clues - unless Beethoven actually had a tiger or something - but this isn't one of those famous cryptic crosswords either! The one who constructed it, clearly didn't know his job. I didn't answer, understanding, that my newly obtained friend had even less success. - Anyway, is the "Sink or salt" some kind of a local pun? Because I don't get it. - It's totally supposed to say "Sink or Sail" there. - Well, since when do you write L with a dash and i with this thing on the upper side? - And that "A"... "S"... - I nervously laughed. - You know what, it might be not a word at all. - There is this thing, called "lit" or something... - I tried to remember, - like, the way of writing words with numbers. This lettering looks like someone curved 5-4-1-7 so that they'd look like a word "SAIL". - Well, that can't be it. If we take that D-13 is indeed "bed" - you couldn't construct this of numbers, now could you? That would really restrict you. - I don't know. This puzzle does look a bit restricted, with words this short. I ordered a beer and started looking through the definitions once more. - So, it's a crossword, but the words are written with a1z26 code. Thus it should be only digits everywhere. There is something special about the words in italics, but it is still digits only. 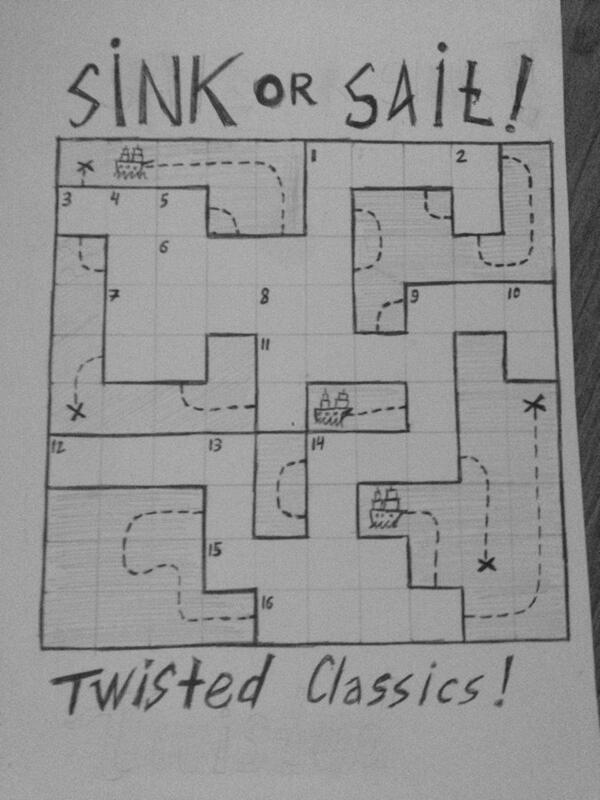 - But the twist is... the puzzle is also a 10x10 sudoku. That was the idea I had in mind when creating it. I might have made some definitions very unclear so I can't guess them myself, but the latin-square rules may help you make a right choice. I was really drunk when the RHPC ordered it from me. - Isn't a sudoku supposed to have areas of 10 where the numbers do not repeat? - Y-yeah. I'm not sure where they are, though. Sorry. I was outraged. The geezer did give me the thread, but it was still somewhat unreliable. - I remember them complaining about me starting word in the middle-cells, but that's just silly. - Silly? You mean, it's enough that the words end where the grid ends, right? - Please tell me the words at least end where they are restricted by grid! His voice cut to mumbling, then he continued drinking. I think that was all the puzzle intel I could get from him. And what does it have to do with the colour of the ticket!? And so, after lots of fishy business I finally get this ticket-decoding diagram from an old sushi chef in North Dakota: So It has something to do with the ticket, And the crossword?.. Unlike the previous hints, the ones below may refer to partial the answers that had been given at the moment. It's highly recommended that you solve the crossword before reading the hints further. You require a finished 10x10 grid of the crossword - which you can borrow from Christoph. 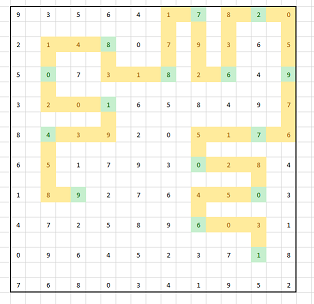 You do not require crossword lines or shiplines, just the number-grid. The upper strategy represents the path to colour of the plate. 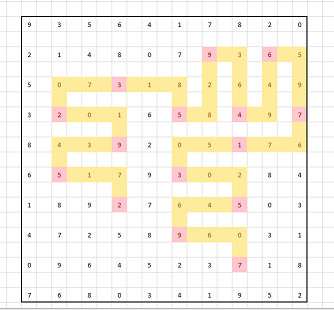 You cut the number into pieces of 11 length (thus 11 is a 'knife'), then you put them into the crossword field and see the resulting shape (that's looking into the pot). The result just tells that the plate is supposed to look exactly like a cent coin (representing the tiny size of the herring served). That's 1 of 4. The 'pi' assumption is correct (but is still not enough for the answer). The 'knight' assumption is correct. Everything is practically solved, so I desperately drawing attention to this question so I can live in peace further. Continuing from where @Gareth McCaughan left off: Since the assumption about the movement between numbers correlating to the body's colour being in a knight's way was confirmed correct, I found a possible pathing between the numbers for it. (Also the cent symbol found means the plate is a cent and should be colored as one). [EDIT] Thanks to @ManyPinkHats If you look at just the highlighted numbers it appears to spell out LIME. This means we have the colour of the body figured out as a lime green colour. For the sauce we do a coordinate grid and take the numbers at these points getting 3,8,5,8,1,8,2,5. If you put these into letters using a1z26 you get CHEHAHBE or if we combine the 1,8 and the 2,5 you get CHEHRY. I believe this is just a typo and that there should have been another reference to (9,2) making the colour of the eye CHERRY. 3 colours, down 1 to go. [EDIT]: Finally figured out what I was missing here. Going through the digits of 2pi when you get to the segment with 307179 you must flip a 7 & 9 as was rumored before. I found 307197 that followed the rule of each digit only touches the following digit. From there I found the possible final image shown below which looks like 'hg'. 'hg' could reference the element mercury which is also a liquid at room temperature and could be a 'sauce'. Finally found some more time and solved the crossword. Hint two states that the crossword uses a a1z26 code. So all the answers should be encoded accordingly. Which raises the question if letters with a code greater than 9 occupy one square or two (one for each digit). 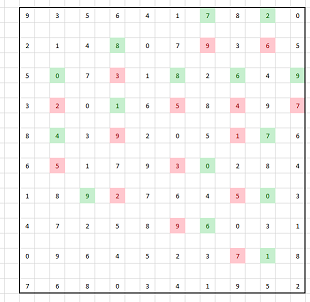 Given the facts that a) the puzzle is also a sudoku and b) "dew" is an answer (see the bounty message), and most likely the answer to 15-across, which has four squares, I conclude that each square holds only one digit. The answer for 15-across would be "4-5-2-3". This also means that some answers are probably really short words. 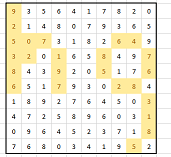 Concerning the sudoku: the missing areas are probably the dotted lines that connect the ships with the crosses. Each digit should only appear once on such a path. @Thomas' comment on this answer makes me assume that we should not add any paths "outside" the solution squares. Some squares just won't have a path. 3: BAD or 2 1 4 - refers to this meme (I never heard about it before!). 6: LEIB or 7 3 1 8 - "leib" is a german word for body. Also "Leib" is a yiddish name, meaning "lion". The hint is printed in italics. Instead of a1z26 we use leetspeak to transform the word to digits. 7: TAFE or 2 0 1 6 5 - TAFE offers training and education in Australia. Also "tafe" is an anagram of "fate". 9: DIG or 4 9 7 - If something's rad, you dig it! If something's deep-seated, you need to dig it. 11: TEA or 2 0 5 1 - "Mate" refers to tea. Tea also appears in "team". 12: RIB or 1 8 9 2 - The first "clone" was Eve, she was cloned from Adam's rib. 15: CDS or 3 4 1 9 - CDs are certainly a bulky way of storing data. 2: BF or 2 6 - Bf stands for "boyfriend"
5: ALOE or 4 7 0 3 - Aloe is a succulent plant that can be used as a medicine. This hint is written in italic again, so leetspeak is used to "translate" it. 8: FBI or 6 2 9 - Don't make fun of the FBI! 9: DAY or 4 1 2 5 - "yard" messed up is "dayr". "noir" is pronounced "no r", so after removing the "r" we get "day". 10: GF or 7 6 - Gf stands for "girlfriend"
13: BED or 2 5 4 - As indicated in the hint. 14: FIX or 6 9 2 4 - Pretty self-explanatory. 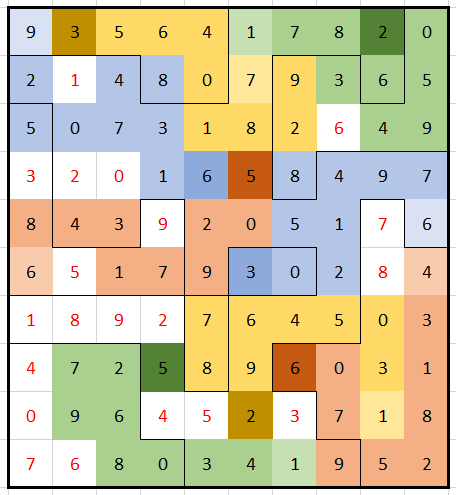 the remaining numbers can be filled into the grid with the help of the paths. I will not explain the reasoning for the paths here - I can't really reconstruct how I solved them anyways. At some times it was mere gut feeling, at other times it was very obvious. In the end it gladly worked out. 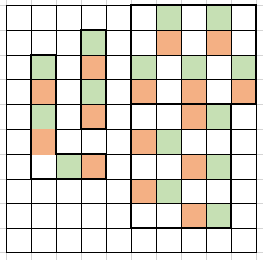 The colored regions are the different paths, the darker squares indicate the square with the ship (the "start" of the path), lighter squares indicate the end. Note that for the green paths this is just a guess of mine. Neither start nor end was initially printed. The red numbers are those that are not part of a path. If you read them from top left to bottom right, they form the number 16320975818924045376. All I can say for now is that it's probably not a a1z26 decoded string. The 40 would make no sense. Each "equation" begins with a "c" ... except that in fact three of them are Cyrillic "s" characters rather than Latin "c"s. But since in-story this is stamped on our ticket and there's no visible difference, I hope this isn't significant. The tNNN number, when A1Z26'ed, yields KNIGHT. where the first bit, at least, seems obviously to be drawing a figure 2.
which might be a cent sign or something. (I have a feeling I've seen a commercial logo that looks somewhat like that, but I can't think where and it may just be my imagination.) [EDITED to add:] Actually, if we put the "split" one digit earlier then we can get an extremely convincing cent sign. Not sure why a cent sign would help us -- maybe we're going to end up spelling out something that starts with CENT -- but I bet that's the intention. The parts of these numbers before the decimal point don't seem like they belong to the paths, nor do they appear to give starting coordinates for the paths, nor do they have an obvious A1Z26 interpretation (KOBM). Perhaps swapping one of the 7s and one of the 9s in the grid would make this all work better. I haven't tried that. Not the answer you're looking for? Browse other questions tagged visual knowledge grid-deduction sudoku crosswords or ask your own question.